Want to know more about lions? Well, we got you covered. Lions are truly remarkable creatures that rightfully carry the name “King of the Jungle.” They got the nickname thanks to the fact they are strong, powerful, and have a majestic appearance, but there are also lots of other things that make them so special. This is why we decided to bring you 10 amazing facts you didn’t know about lions and get you more familiar with the ruler of the animal kingdom. So let’s begin. 1. Lions usually sleep from 16 to 20 hours per day. This is what you call a life of royalty. 2. Lions live in a group known as pride. Each pride has a leader and can have up to 15 members. 3. Lionesses are the ones that do most of the hunting. 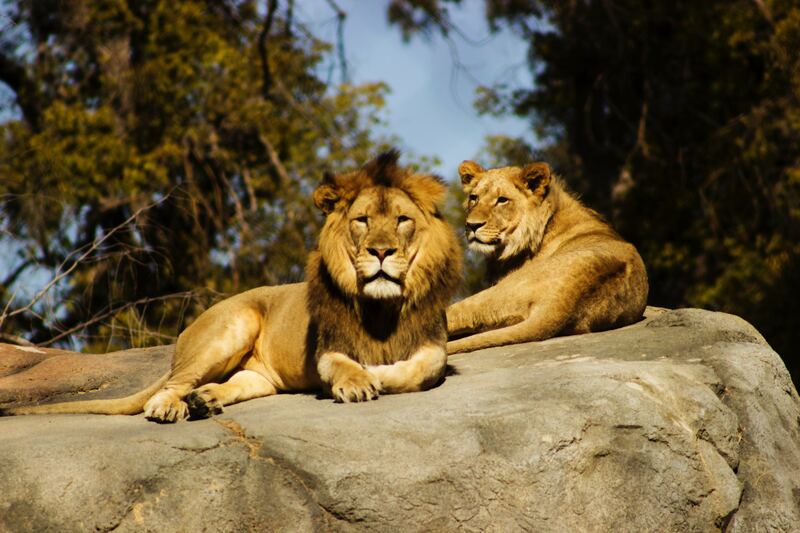 Male lions patrol the area and protect the pride. 4. Lion’s life span almost doubles in captivity. In nature, they live from 10 to 15 years, while in captivity, they can live almost 30 years. 5. Lions are one of the fastest land animals. They can run at a speed of 50.0 mph (80.5 km/h). 6. An adult lion is required to eat 10 and 15 pounds of meat to satisfy its daily need for food. 7. Lion’s roar is so mighty strong that it can be heard from a distance of 5 miles. 8. While they now mostly inhabit Africa, lions also lived in Europe, the Middle East, and North America in the past. 9. When they walk, lions do not touch the ground with their heels. 10. And the most surprising of them all. Although the lion is called “King of the Jungle,” lions don’t live in the jungle. They actually in grasslands and plains.